Debatably the standout film of the French New Wave, Jean-Luc Godard’s debut remains a landmark in cinematic history, failing to lose any of its charm, beauty and brilliance 50 years on. Godard and his likeminded colleagues were fed up with the state of France’s cinema in the 50s- lacking in originality, full of narratives that said nothing to the youth of the time and above all else not valuing cinema as a respected art form. Starting out as film critics, the pioneers (Truffaut, Godard, Chabrol and Rohmer to name a few) of the New Wave, or Nouvelle Vague, turned cinematic convention on its head by crafting innovative, striking works of film. A key part of Europe’s expansive New Wave of cinema, the French movement became a key influence in filmmaking with the Hollywood Renaissance being the biggest benefactor of the new approach, Bonnie and Clyde the most obvious homage to Breathless. Following petty thief and suave ladies’ man Michel Poiccard (Jean-Paul Belmondo) around Paris for the day as he evades the police and tries his love interest’s patience (Jean Seberg), Breathless is a simple yet enthralling film, mainly down to the sheer allure of the charismatic lead, expertly handled by Belmondo. The story may not be the most complex or in fact, after viewing again, eventful but the whole arrangement is unflappable. Truffaut’s witty script along with Godard’s choppy direction and Belmondo’s enigmatic performance create a perfect package that hasn’t faded one iota with age. 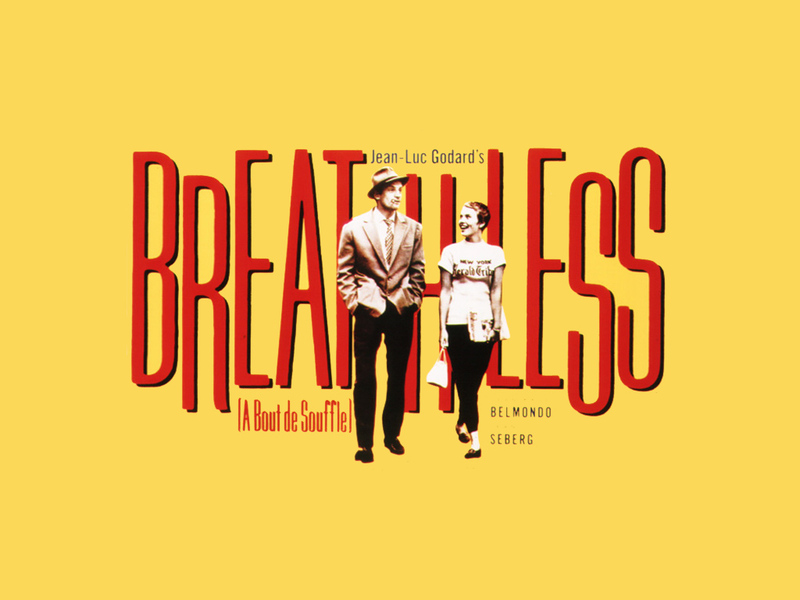 While Godard’s jump cuts, reverse shots and destroying of cinematic convention is what Breathless was famed for its Belmondo’s performance that stands out about the film now. The innovative directorial approach seems slightly bizarre, even outdated in today’s era of blistering special effects and mammoth CGI whereas Michel Poiccard continues to be a timeless protagonist. Michel exudes charm throughout, balancing the suave sophisticated side against his childlike cheek, all while looking exceptionally dapper in his tailored suits, trilby and host of vintage stolen cars. Playing the faux- gangster, the homage to the traditional American wise guy is obvious through the nod to Michel’s hero “Bogey” (Humphrey Bogart) and his playful parody of the tragic American noir anti-heroes. Belmondo, in his breakthrough role, looks and acts the part written from him by Truffaut, his handsome yet slightly rugged looks make a harmonious matrimony with the illegal, hedonistic nature of Michel’s life. The mundane tasks of getting a taxi, ordering breakfast and driving through the countryside are nothing short of spellbinding due to Belmondo’s spontaneity and irreverent approach. Slating women drivers, peeking up women’ skirts and berating slow taxi drivers are just a few of Michel’s amusing shenanigans that light up the film. He may sound rude and chauvinistic but watching Michel at work is a joy and nothing short of charming, like a naughty school boy you can’t help but applaud his audacity. Outside of his quirks is a deeply well rounded character with hates, loves and passions about life that portray someone as much more than just a petty thief or pretend gangster. He’s impulsive, easily distracted as he races through his feelings and thoughts with little time to sit still or worry about life’s routine troubles. The archetypical loveable rouge yet his conflicted feelings make him an enigma, one that the audience is desperate to know more about, while his honesty makes him entirely relatable. Far from perfect, his acute social observations and conflicted feelings give him enough vulnerability to make sure he’s not out of touch with reality or the viewer. With the New Wave dream team of Godard and Truffaut behind the camera (and briefly in front for a Godard cameo) it’s impossible they wouldn’t have put their personal stamp on the film, and it’s evident to see. Godard breaks Hollywood’s golden rule by merging the cinematic narrative and the audience’s reality, something that is often deterred in film as it breaks the audience’s belief in the story. The chopping scenes of dialogue coupled with the fact Michel is at points addressing the audience blurs the line between fiction and reality, but rather than ruining the story it puts the viewer in the passenger seat, a partner in crime. It’s challenging and bold camerawork, held together by a suitably French jazzy soundtrack, which sets this film, and a majority of Godard’s filmography, apart from being a mediocre tale of a small time crook. The break from convention is a breath of fresh air (no pun intended) from the ultra-polished, glossy Blockbusters of today. The simple tale is a master class in filmmaking from the leaders of the French New Wave- the directing, the script and most importantly the acting is both brilliant and a shining example of what the New Wave was all about. 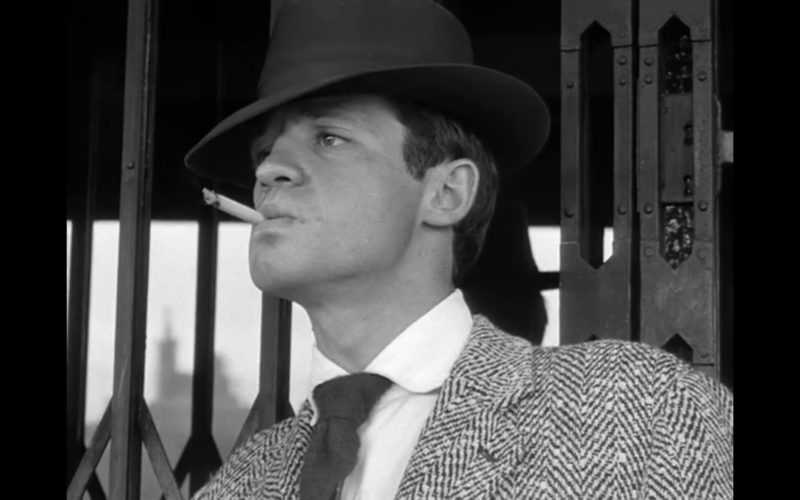 An iconic ending, suitable of the most ardent self-destructive noir gangster, is befitting of Belmondo’s superb performance, a climax that’s a purposeful epitome of the film’s deeper themes and meanings. The author in Breathless is asked “What is your greatest ambition in life?” to which he replies “to become immortal… and then die”. Suitably the quote works beyond the narrative, applicable to Godard and Belmondo’s masterpiece- a film that has survived the test of time, living through the New Wave to become a revered piece, outgrowing its context to take its place beside Citizen Kane and La Strada in the cinematic hall of fame. ← Ryan Gosling: A Career of Unfulfilled Potential?